I really have been in fun food mode, especially with Halloween coming up and fall here. See, in the summer most of us Minnesotans are out doing whatever we can to take advantage of the weather, but when fall comes we like to tuck in and party at home. Or at least I do! And especially if I have Juicy Lucyfer Sliders. Juicy Lucyfer Sliders – this is just so you can see the inside but never ever cut your juicy lucy! The Juicy Lucy (or Jucy Lucy), the iconic cheese stuffed burger, is a Minnesota thing, you betcha! Two rival Minnesota bars, Matt’s and the 5-8 Tavern have been making these for decades, but recently the cheese stuffed burger has gone all gourmet and with good reason. There’s something about a great crusty burger with an ooey, gooey, cheesy filling that just puts all other cheeseburgers to shame. 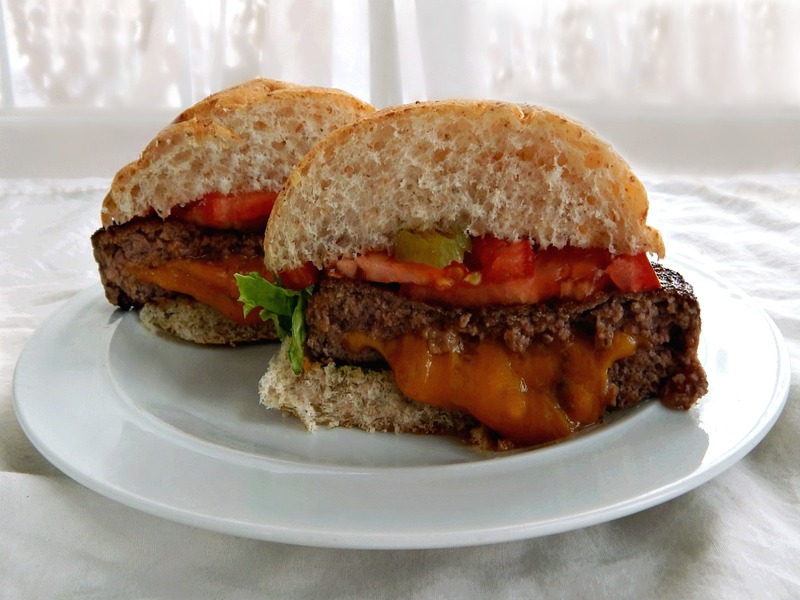 Juicy Lucy – The ultimate cheese stuffed burger – btw – never cut in half! For display purposes only!